When you come back up, even a dark, gray day looks brighter. Here on the wet West Coast, where winter closes in with endless clouds, rain, and steadily diminishing daylight, we take seasonal depression seriously. I have a “happy light” glowing on my desk as I write this. So there’s nothing I’d like to recommend more than doing a backbend over a chair, (more properly two-footed inverted staff pose in a chair), whenever the weather turns your mood sombre. There are other poses that can help with depression, it’s true. Vigorous standing poses and handstands can lift your mood, especially if dark winter days leave you feeling like staying in bed, with the covers pulled over your head. Mind you, if that’s your kind of depression, standing poses and handstands are probably the last things you feel like doing. And if you’re not a strong practitioner, a few wobbly warrior poses or failed kick-ups into arm balance could leave you feeling worse than when you started. It doesn’t take much energy to drape your upper back over the edge of a chair. And you don’t need to be strong, or even experienced. If you have an existing back or neck injury, you might need the help of a teacher, but fixes can be found. And best of all, given the right support and a bit of practice, almost anyone can hold the pose for a long time – say three to 10 minutes – which is long enough for it to have a profound and lasting effect. But here’s the issue: you can’t just go to a store and buy a yoga chair – a metal chair with the back cut out – although there are some solutions available. And even if you could, metal chairs are, as we say, “one size fits some.” If you’re petite, you could probably do this pose in a chair with the back left in. If you’re large, you might not be able to do it with the back cut out. 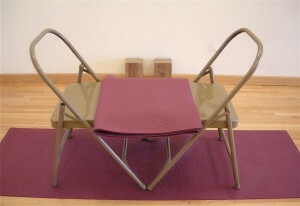 The simple solution – use two chairs, seat to seat – is almost as good as using a yoga chair. You can, of course, use just about any two matching chairs. I think it’s worth buying a couple of metal chairs: they’re inexpensive; they have the hard surface you need; and the way they’re built makes them suitable props, even with the back left in, for most yoga poses, including, most importantly, chair shoulder stand. Besides, they fold, so they don’t take up much space, and with the backs left in, they’re more comfortable when they’re pressed into service as extra chairs. Start with your head in line with your spine, then, as you become comfortable, gradually reduce the height. Unless your floor is carpeted, roll out a sticky mat with its long side toward the wall. Put the chairs, seat to seat, as close as you can get them, on the sticky mat. Fold a second sticky mat in four, and place it across the gap between the two chair seats. Stand two wood bricks on their tall sides at the wall. Then do a test run. Lie down on the chair with the bottom edges of your shoulder blades hooked over the side that’s away from the wall, and straighten your legs. You want your legs to be completely straight with your heels both touching the bricks and pressing into the wall. Make whatever adjustments you need, then sit on the edge of the chair that’s closest to the wall. Supporting yourself with your hands, take your buttocks over the edge of the chair on the wall side. Lie back, then move toward your head until the bottom edges of your shoulder blades hook over the edge of the chair. To come back up, wiggle your buttocks back toward the middle of the chairs, and hold onto the chair backs. If this is new work for you, have a stack of bricks or other height available for your head. As you settle into the pose, you can gradually remove some or all of the support. You won’t be able to reach under the chair to hold the legs as you might when you’re using just one chair. Instead, experiment with holding your elbows, or holding the back of your head in your hands, as though you were doing headstand. Be sure to change the cross of your hands. Then, as in the photo above, extend your arms long, either with or without support under the back of your head. Sit up chest first, head back. Set a timer, at first for just one minute. If that’s enough, come up, rest, and then repeat the pose. Gradually increase your time in the pose. Five minutes would be a good goal. To come out, wiggle your buttocks back toward the middle of the chairs. Hold the back rungs of the chairs, and pull down as you swing out, leading with your chest. If your lower back feels tight or pinched, come out and put more height under your feet. If that doesn’t make the pinching go away, bend your knees and put your feet on the floor. If you have tight shoulders, your arms might begin to tingle as you hold the pose. If this happens, clasp your hands and rest them on your belly. 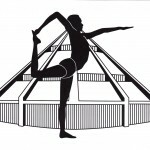 Do you have a favorite yoga technique for weathering dark days? Do tell. Thanks, Eve, your timing for me is spot on. Cloudy day inside and out now brightened and lightened by your outstanding post. I was thinking of purchasing one of those large balls to work on backbend but your guidance does so much more. “Tis not for me to wonder why….” it just does. Happy to be of help. I had one of the large balls and ended up taking it into the studio where some of the other teachers use it. It was nice, but back bend over a chair took me deeper, faster. So glad you liked the post. I had a look around for contraindications to happy lights and couldn’t find anything definitive – a special interest to me since there’s a family history of glaucoma and cataracts. I’d hate to have to choose between light and vision. Do you have a link you could share? I welcome this advice greatly, especially today Friday, such a miserable day. I work from home, which I love, but the downside is I can slip into a depressive mental state pretty easily. Will try this today before lunch. Thanks Eve! (I am Gerie’s student at Yoga on 7th). I’m with you on the pros and cons of working at home. I heard a story once about a man who worked at home, but got up every morning, got dressed, left the house, walked around the block and came back in and settled down to work. Me, I’m happy to put in an hour while I’m still in pajama pants. Excellent post. I appreciate the time you take to provide wonderful photos and modifications. I sent this to my mom as I believe it would be a great pose for her to perform in the winter months. Thanks Christine! I’ll also pass your thanks on to Mary, who is my partner in the Yoga on 7th studio, and also the person who takes the majority of the pictures. I hope your mom gets some benefit from the pose. Great simple solution to use 2 chairs! Of course ( why didn’t I think of that- a chair seat is square in fact). And what a wonderful pose. How important do you think it is to have head supported when in a ‘maximum/deep’ Viparita Dandasana if the objective is anti-depressive? I have notes from Karen Wilde’s workshop saying the ‘depression relief’ version is to face more towards the ceiling and to have support for the head towards the the back of the skull as opposed to the crown. I assume this has something to do with the final resting position of the brain. It seems however to run contrary to Geeta’s advice above. I’d love to take credit for the two-chair solution, but in fact I learned it from Claudia MacDonald, whose chairs at Britannia Community Centre weren’t yoga chairs, but did work seat-to-seat. From my personal experience, I tend toward Geeta and Lois Steinberg’s advice. I love the pose with my head unsupported and feel like “letting go of my head” is a large part of why the pose feels so good. I wonder if, like so much in yoga, it comes down to individual cases. Thanks Eve, just this morning with my practice I was thinking how much better I feel after doing some shoulder and chest openers. I feel energized and ready for my day. Great to read the benefits. 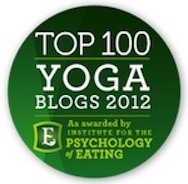 I was comparing it to feeling completely exhausted after hip work where I’m ready for savasana. Yes, time to do the backbend work. Thanks again! Good to hear from you. I too love shoulder and chest openings. 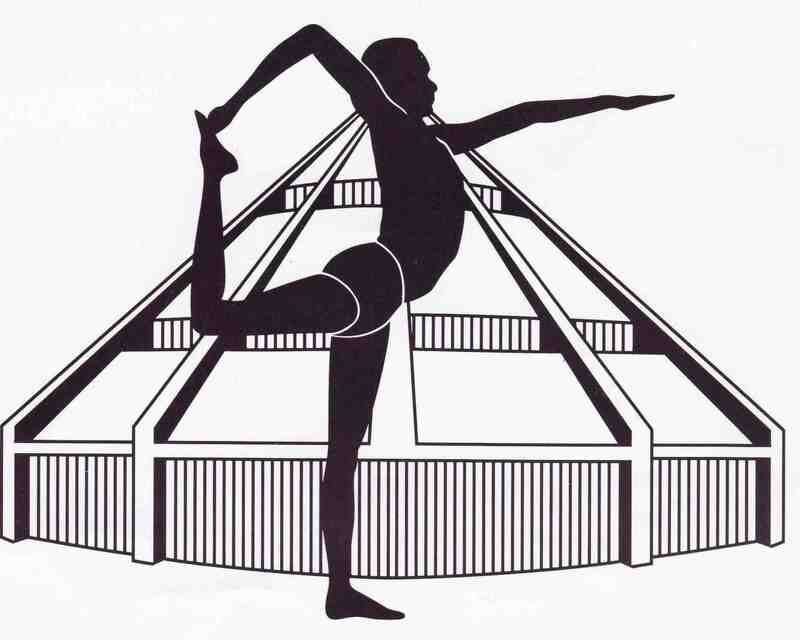 In some ways it seems like those poses are morning poses, and hip openings, which can make you drowsy, are evening poses. Ah to have the luxury to do yoga all day long. . . .